I made a £3000 donation to the Karen Woo Foundation, in honour of Karen’s Woo’s courage and determination. Dr Karen Woo was a British doctor, who trained at University College London, and was tragically killed by militants in Afghanistan in August 2010. The team she was part of had taken a week to trek to the remote province of Nuristan where, over the course of 8 days they treated in excess of 1500 people for ophthalmic, dental and general medical problems. Some of those seeking medical assistance had walked for 3-4 days to the village of Parun, where the group had based itself, upon hearing that medics had arrived in the area. She strived to increase access to medical care for those in the country who need it most. The Karen Woo Foundation has been set up in her memory to continue the work that she started. Karen Woo showed great courage and resilience to do what she did. I promised myself that when the time was right I would recognize my gratitude for the inspiration I drew from Karen in my own life and for the wonderful example she set. 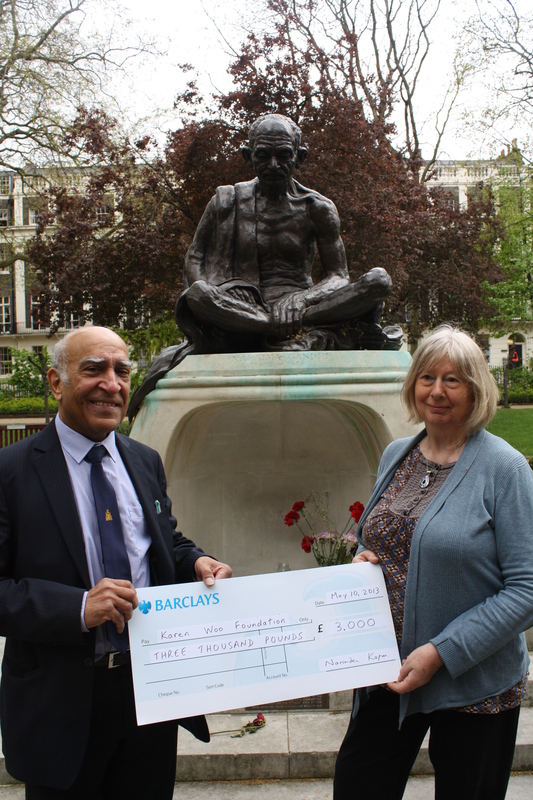 Karen Woo’s mother, Lynn Woo, accepted the donation, in front of the statue of Mahatma Ghandi in Tavistock Square, on behalf of the Karen Woo Foundation. The funds will be used to increase access to desperately needed health care for women and children in Afghanistan. More details about the Karen Woo Foundation can be found at – www.karenwoofoundation.org. From my perspective, the main purpose of that occasion was to remember a brave, intelligent and kind-hearted young doctor whose life was tragically cut short in the most awful of circumstances. When a tragedy like this happens, a whole family is shattered and their lives changed for ever…I also wanted people to remember Karen’s mother, father and two brothers and the courage that they have shown over the past few years. The ceremony was in front of the statue of Mahatma Gandhi. There was a reason for this. Gandhi stood up against injustice. Injustice can be manifest in a number of ways…injustice in poverty and in health, which Karen Woo did so much to alleviate, but also injustice in other settings, such as in parts of the National Health Service. Both I and many other NHS staff have felt that injustice at first hand. We should therefore in the name of Gandhi strive to remove injustice so as to make the world a better place, and thus cherish the ideals that Karen Woo stood for.